Last week’s post on Merkel’s very good chances to win a third term created a bit of a stir. This week, I’m back with nine new polls (conducted between August 6 and August 19 by six different companies), which all point into the same direction. On average, polls are in the field for five days (with a standard deviation of three days), so I continue to anchor each poll to a specific week in the calendar. Along with the raw data, the graphs show estimates for the true support for each party over 32 weeks, starting from Monday, the 31st of December. Eight of the new polls cover week 31 and week 32, while one is a late addition to estimate for week 30. Estimated/predicted Support for Major German Parties (2013 election). Click for Larger Image. Support for Merkel’s Christian Democrats is between 39 and 47 per cent. The model, which accounts for previous levels of party support and variation across pollsters, puts them at 41 per cent. Findings for the major opposition party, the Social Democrats, are less variable at 22 to 25 per cent. 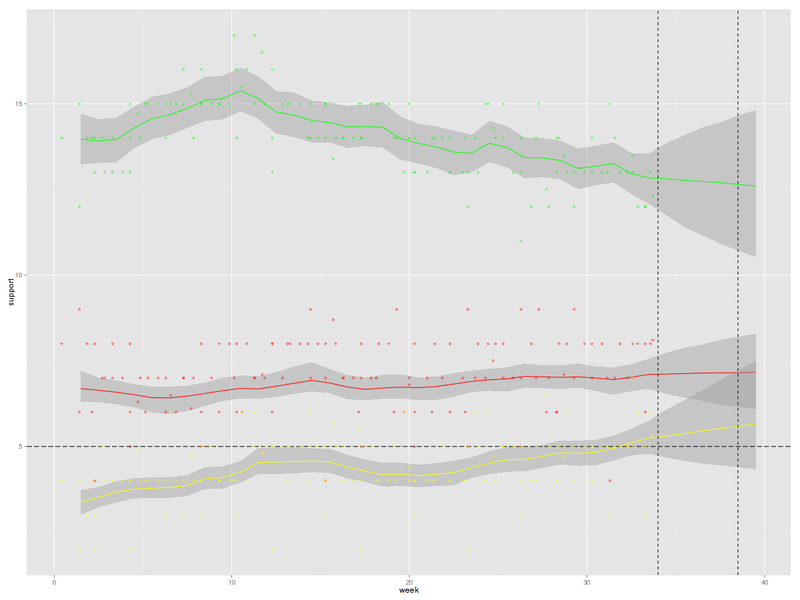 The model places them at the upper limit of these current polls. Results for the Greens are even more unanimous (12-13.5 per cent). The model agrees, confirming that their support has come down a tick or two over the last weeks. 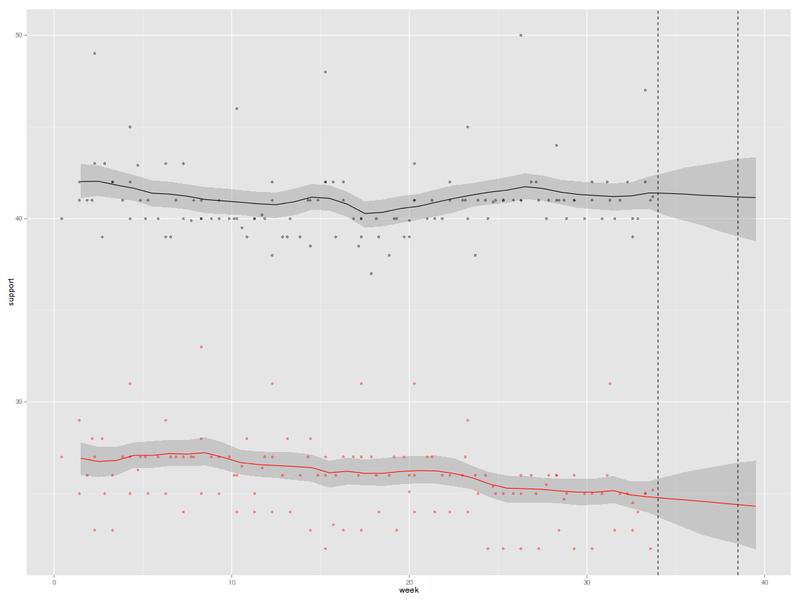 The same cannot be said for the Left, which is almost static at seven per cent (polls: 6-8.1). That is well below their 2009 result, but also well above the electoral threshold of five per cent. Finally, for the Liberals, Merkel’s coalition partner, things have improved ever so slightly. While the polls vary from three to seven per cent, the Liberals’ true level of support is currently estimated at 5.2 per cent. More importantly, after months of continuous near-death experiences, there seems to be an upward trend. 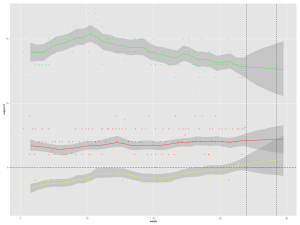 Estimated/predicted Support for Smaller German Parties (2013 election). Click for Larger Image. What Does That Mean for September 22 and Beyond? This is my first shot at pooling the pre-election polls, so all predictions should be taken with a very generous pinch of salt. The model is possibly misspecified and rests on an number of questionable assumptions. The most obviously problematic amongst these is that polls are, on average, unbiased over the whole January-September timeframe. But hey, this is a blog, so let’s ignore this (and all other) problems for a second and believe that the trend-lines and credible intervals for the next four weeks are indeed credible. Once we make this leap of faith, the probability of a return to a Red-Green coalition is approximately zero. Amongst 10000 simulations of week 38/39 (the election is on a Sunday), there is not a single one that gives a parliamentary majority to this prospective coalition. The FDP, on the other hand, makes it past the electoral threshold in 83 per cent of my simulations, and in 78 per cent, there is a parliamentary majority for the present coalition. The true probability will be higher, as some CDU supporters will vote strategically for the FDP to help them across the threshold. If we assume that this behaviour is virtually guaranteed to succeed (it would be enough if about one in 40 CDU would cast a “loan vote”), the probability of a majority for the present coalition goes up to 90 per cent. Put differently, the probability of a Red-Red-Green coalition (SPD, Left, Greens) is between 22 per cent (no loan votes for FDP) and 10 per cent (loan vote strategy works perfectly). 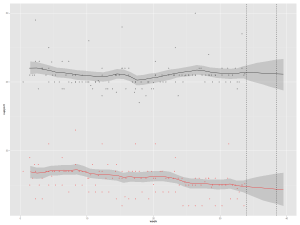 But even if there was a majority for the three opposition parties, a coalition (or rather a toleration arrangement with the Left) would be highly unlikely (say p=0.1), making a Grand Coalition led by the CDU the default option. That again means that the probability of any government not being headed by the present chancellor is between one and two per cent (down from four per cent last week). For several months, most pollsters did not publish separate results for smaller parties such as the eurosceptic AfD or the internet-centric Pirates. Some have resumed giving itemized counts for “other” parties, and it currently seems safe to assume that neither will enter parliament. If they did, the Pirates would probably take away votes from the left parties, whereas the AfD would most likely weaken the two major parties. In either case, a Grand Coalition would become more likely. The July issue of PS has two short pieces on forecasting models for the September election. Both pick Merkel as winner. So do Bundewahltrend (average over the six most recent polls), pollytix (weighted average of 15 most recent polls), and wahlistik (a poll aggregator run for the Zeit weekly). Las weekend, politicians in both major parties began floating the idea of a Grand Coalition, but given the latest polls, four more years of centre-right government seems to be the most likely option by far. This post comes with lots of health warnings attached. In the past, forecasts have failed, faces have turned red, majorities have collapsed well before election day. I’ll be back once I have collected the next batch of polls.